Lynn sent me an item that’s been making the rounds as an e-mail forward. Though I’m reluctant to post something that I cannot properly credit, I’m going to do so. I like it that much. Cashew, my 14-year-old yellow Lab, is blind and deaf. 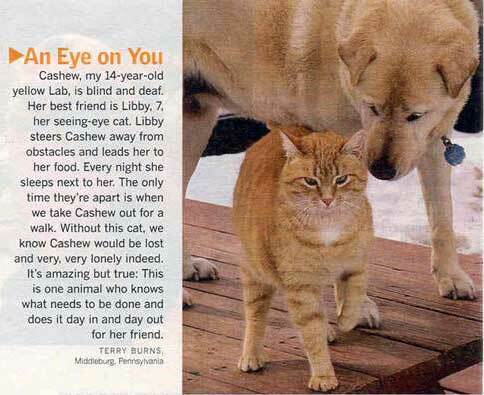 Her best friend is Libby, 7, her seeing-eye cat. Libby steers Cashew away from obstacles and leads her to her food. Every night she sleeps next to her. The only time they’re apart is when we take Cashew out for a walk. Without this cat, we know Cashew would be lost and very, very lonely indeed. It’s amazing but true: This is one animal who knows what needs to be done and does it day in and day out for her friend. If you know where this originated, please let me know so that I can offer proper credit! There are 9 reader responses to "Libby, the Seeing-Eye Cat". A sad story. I’m sorry I read it. I’m so amazed at animals’ nurturing and protective natures. We as humans could learn much from them in terms of acceptance and getting on with it, to lead a happy life. Please don’t feel sorry for this dog. I’ve worked with blind humans for many years. I don’t feel sad for them, I help them when needed, and learn from them always. Pity is destructive to everyone. Anyway, if you are a cat lover we have the cutest cat and I will send you some pics. Maybe you would like to do a post on this particular breed of cat – called a “Scottish Fold” (google it and look at the amazingly hilarious pics). We actually rescued ours (he doesn’t have papers, but who cares) from the SPCA and then began finding out the story about this breed. They are quite unusual and he replaced our kitty that we had had for almost 15 years. We all almost died when Kitty died, so we got “Sam” 2 days later. I will send you some pics if you would like to write about this very cool breed of cat. We have talked to a couple of breeders (not many breeders even exist!) – and purebreds sell for between $2,000-$2,500!!! We were so amazed to learn all of this and can’t believe he was close to being non-existent – papers or no papers!!! Email me and let me know if you’re interested in this info and some pics from us of Sam. I wish we had a video camera and could get you some good video, but we don’t, so all I can send is pics, but don’t want to send stuff to you that you might not be interested in. “Clipped From” http://meryl.net, is what is says at the top of the clipmarks page…..
submitted on 10-24-08 by member name: luckystar at the forum listed below. In 1998, a six-week-old kitten abandoned in a pet store was found to be so severely malnourished that a veterinarian warned she was unlikely to survive. She was taken home by Terry and Deborah Burns of Middleburg, PA, who soon discovered that her rough start would not deter this intuitive little feline—whom they named Libby—from performing a very special task. In her new home, the kitten met the Burns’s seven-year-old Lab/shar pei mix, Cashew. Terry Burns remembers how their relationship began: “Cashew would poke her head into the kitten box for nuzzles, seemingly just to let Libby know that she wasn’t alone.” The two spent the next seven years together. When Cashew passed away at age 15, Libby missed her deeply, and continued to sleep in their bed and watch for her return. “The only time they had ever been apart was when Cashew went for her walks,” says Terry. What a very touching story.